Ben Barr - geckos, skink, pūriri moth, Hochstetter frog. In 2009 the sounds of all the native birds were added to the dictionary. We gratefully acknowledge the McPherson Natural History Unit and Viking Sevenseas Ltd for permission to use these. 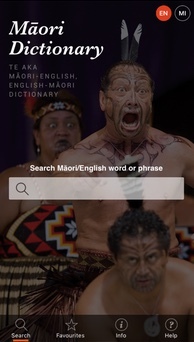 This dictionary complements the series of four textbooks and related resources in the Te Whanake series for learning the Māori language. 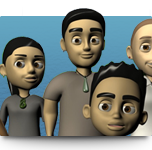 For further information about the Māori language resources please visit the Te Whanake resources website. 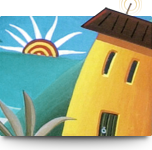 The historical loanwords collection was added to this website in October 2009. This was a FoRST funded project from 2005 to 2009 although work began on it in 1998. You can opt to include the historical loanwords into your search. 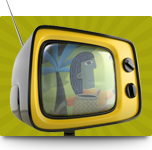 This is a collection of over 18,000 loanwords from the Māori-language newspapers and the Paipera Tapu, the Māori Bible, and a few other sources. These were all published from 1842 to 1952. A significant number of these loanwords are still in use in modern Māori so will also appear in the main Te Aka dictionary. We were unsure of the meanings of about 300 words. We have indicated this at the end of the entry for these, but are hopeful that further research will provide clarity of meaning. An article about this loanwords project and its findings is available in the online peer-reviewed journal Te Kaharoa. Most words in Māori fall into one of two broad classes: those which contain the main meanings of a sentence, called bases, and those which occur before or after these words and add meaning to the bases, called particles. There is a small group of words, sometimes called interjections, which do not belong to either of these classes, e.g. Āe (Yes), ā (and), Kaitoa! (It serves you right!). The following are brief descriptions of these word classes, but fuller explanations can be found in the introduction to the hard copy of the dictionary. Bases can be divided into five main sub-classes depending on how they function within the sentence and in relation to each other and the particles. Nouns or common nouns: These are words that are not normally used as verbs, e.g. whare (house). These words typically label things, people and ideas and can follow the particle ngā (the - plural), e.g. ngā tāngata (the people). All nouns in Māori can be used with the particles sometimes called determiners, i.e. he (a, some) and te (the). They can also be used with the possessive determiners, e.g. tōku (my). Verbs or universals: These are words that designate activities and events. They can be used as nouns or verbs. They may also be used passively, taking passive endings in most passive sentences, e.g. Kua horoia ngā rīhi e ia. (The dishes have been washed by her.) In this dictionary these passive suffixes are given in parentheses immediately following the headword. If several different passive endings are used, these are given in alphabetical order, e.g. iriiri (-a, -hia, -tia) (baptise). Where there is a change in the form of the word when the passive ending is added, the word with its passive ending is given in full in parentheses, otherwise only the ending, preceded by a hyphen, is given, e.g. titiro (tirohia) (to look at). Location words, locative nouns or locatives: Words that directly follow particles like i and ki fall into this group. They are also preceded by a when they occur as the subject of the sentence, e.g. He mahana a roto. (It's warm inside.) They include all place names and a small group of other words relating to location, e.g. runga (up, on top). This class contains names of regions, rivers, mountains, marae, as well as names of places, e.g. Taranaki (Mount Egmont). In this dictionary words that are classed as verbs (or universals) and statives (or neuter verbs) are likely to have separate entries listed for each different part of speech, along with example sentences for most. Particles may occur before or after particular base classes. Idioms and colloquialisms are included in this dictionary with explanations about how they are used, together with sample sentences with their English translations. Several symbols are used to help the reader understand how to use each one. 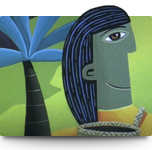 If alternative words can be used in the idiom or colloquialism, the words are included but are separated by a slash. If square brackets are used around a word or words they indicate that other appropriate words may be used in place of those given. Round brackets indicate that the word, or words, within the brackets may be omitted from the idiom or colloquialism without significant change to the meaning, although these extra words often intensify the meaning. If three dots precede or follow an idiom or colloquialism, this indicates that it must be preceded or followed by another word or other words and cannot stand alone. 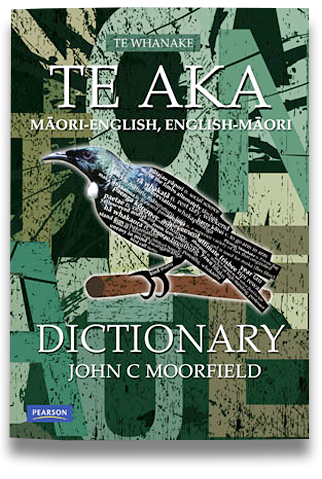 Unlike some of the other Māori language dictionaries, this one lists the words wholly, or partly, transliterated from non-Polynesian sources, indicated by (loan) after each one. This label is also used even if only part of the word or phrase is borrowed, e.g. pāpara kāuta for a tavern, hotel or public house where pāpara has been transliterated from 'public', while kāuta is a Māori word for a cooking shed, kitchen, cookhouse, house, shack or lean-to. While this dictionary does include vocabulary that is peculiar to particular dialects, it does not include dialect forms that involve sound shifts, except for some place names. Such sound shifts include 'n' for 'ng' with some speakers from Tūhoe, the shift of 'ng' to 'k' with some speakers from the South Island, the shift from 'wh' to 'w' and from 'h' to the glottal stop with some speakers from the Whanganui-Taranaki tribes. The Te Whanake series and this dictionary follow the orthographic conventions of Te Taura Whiri i te Reo Māori, including the use of the macron to show vowel length. 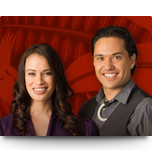 Māori has five vowel sounds but, like other Polynesian languages, each is either short or long. Short vowels are always written with 'plain' vowel letters. Long vowels are almost always written with a macron over the vowel in this dictionary. The distinction between short and long vowels usually carries meaning, e.g. kēkē (armpit), kekē (to creak), keke (loan) (cake). When reduplication of part or all of a word occurs; when what were historically two words are now regarded by native speakers as one word; or when a prefix is added to a base word, double vowels may result. In these situations macrons are not used, e.g. hāereere (to wander about, stroll, meander), manaaki (-tia) (to support, take care of, give hospitality to), whakaahua (-tia) (to photograph, photograph, illustration).